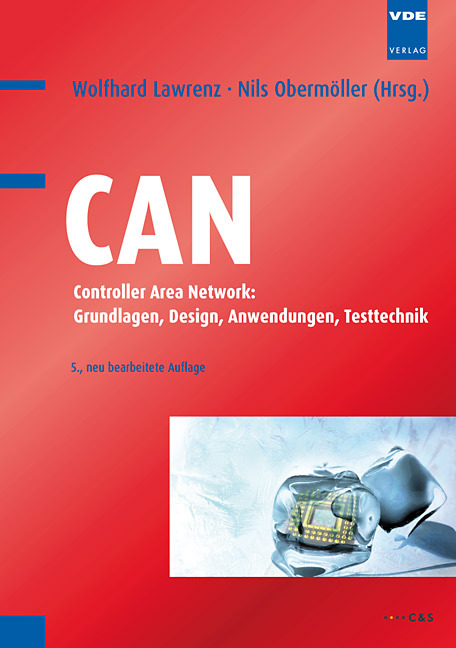 The fifth edition of the 484-pages book (ISBN 978-3-8007-3332-3) features basic, design, application, and test procedure information about CAN. The two publisher and 43 sub-authors have written this book, which provides a complete overview on CAN technologies from the physical layer to the application level. The first chapters are related to the basics of communication (field-bus) technology and the general architecture of CAN networks. The next two chapters deal with the CAN physical layer and the CAN protocol implementations. The following chapter provides an overview on higher-layer protocols (e.g. CANopen, diagnostics on CAN, SAE J1939, CANaerospace/Arinc 825, DeviceNet, and CanKingdom). The book also covers the design of deterministic networks, CAN applications, conformance testing, emulation of CAN networks, and describes briefly some other network technologies (LIN, Flexray, Most, USB, etc.). The book seems to be a collection of articles, which are not always harmonized in writing style and use of terminology. Therefore it is not a book for beginners and students. Sometimes the reader is lost in details. Some chapters are stand-alone and they are not integrated into other parts of the book. It is the most complete book about CAN technologies and provides an overview for experienced readers. The book is also available as an E-book (PDF) by the publishing house.